Over the last week I've been holding various conversations, one which you can hear on the latest episode of Cinema Royale, about Hollywood's response to Black Panther's success and the comparative failure of A Wrinkle in Time. My feeling was that Ava DuVernay, the first woman of color to direct a $100M film, would probably not get another shot at a property that big, and we may see some kind of backlash against black filmmakers. Sometimes it feels good to be wrong. 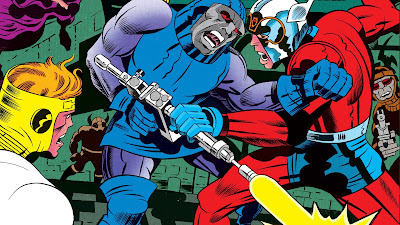 DuVernay has been hired by Warner Bros. to bring Jack Kirby's New Gods comics to the big screen, and that is a very big deal for a number of reasons. Created in 1971, New Gods follows a cosmic race of beings from the warring planets of Apokolips and New Genesis. Their stories are huge, usually told separate from the tales involving Superman and the other DC heroes. They were created after Kirby left his home at Marvel Comics and went to DC, taking full creative authority over the series and its wild cast of characters. A screenwriter is being brought in to work with DuVernay on the film, which will apparently be outside the events of the DCEU. That's an odd move because we've already felt the influence of the New Gods in the events of Batman v Superman and Justice League. The villain Darkseid hails from the planet Apokolips and is the master Steppenwolf is attempting to serve in Justice League. Those parademons are basically his pets. Strange they would keep these things separate, but on the other hand Warner Bros. probably wants to give DuVernay as much creative freedom as possible. They also probably realize that New Gods has the potential to be a massive franchise all by itself. They exist in a place completely separate from the DC Universe known as the Fourth World, which can only be accessed via teleportation by a Boom Tube. The peaceful realm of New Genesis is ruled by Highfather, while Darkseid lords over the hellish landscape Apokolips. Darkseid hopes to solve the Anti-Life Equation, a formula that would give him control over all sentient beings. The ideas Kirby had for New Gods were originally envisioned for Thor. Their stories aren't just typical superheroics but deal with family legacy and politics. Mainly, this keeps DuVernay high on the pecking order of blockbuster directors, and gives her the chance to helm a comic book movie after she passed on Captain Marvel. No word on when she will begin on New Gods but it may be a while. She's currently working on a Central Park Five series for Netflix that has her priority.